Odd choice of a hashtag there, Oscar. How can you call this a “Fans First” issue when only 1,000 out of 16,800 tickets were actually available to the public? The more pertinent questions – why were so few tickets available? And has this superfight ever put the fans first? 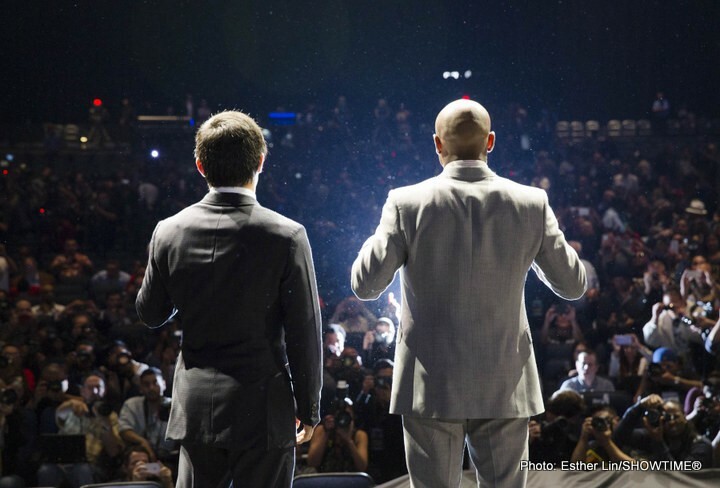 Mayweather-Pacquiao should be a love letter to fans. It’s the once-in-a-generation event every generation deserves. They’ve hoped and prayed for Mayweather-Pacquiao since 2009. Now the fight’s finally here, the invitations have been issued, but it doesn’t seem like those fans are welcome. Instead, this enterprise merely exemplifies the asinine business model that’s slowly killed boxing for the last two decades. Promoters are taking their usual disastrous course of action. They’re taking a working class, blue collar sport, and explicitly pricing it far beyond the means of that working class, blue collar demographic that actually constitutes the fan base. Imagine a Mayweather-Pacquiao price tag on any other sport (baseball, football, hockey, etc. ), and then imagine that sport staying relevant. According to USA Today, only 500 to 1,000 tickets recently released for sale were actually available to the public (the final count was 1,000). The MGM Grand can host 16,800 fans. The rest are divided between the “casino, boxers, sponsors, promoters and HBO/Showtime,” according to Forbes. No wonder this is a fan issue for Oscar. Being bother a boxer and a promoter, he’s covered! It will cost you $100 to buy the fight on Pay Per View, the highest ever. It will cost you $10 to attend the weigh-in, the first of its kind in boxing history. Promoters have covered of this act of exploitation by claiming the weigh-in money will go to a charity of the boxer’s choice. But that rings hollow for me when you consider that, in additional to all other financial records, Mayweather-Pacquiao ALSO just broke the record for most money generated by sponsors – a whopping $13.2 million. Surely the powers that be could have spotted us. It will cost you $150 to watch the fight on CCTV in a Vegas Hotel. Not the MGM Grand of course – you’re far too poor for that. I’m not naïve. I get it. Boxing is a business. The point of business is money. Ergo, the fight should maximize profits. But another big part of the business model is also making new customers while retaining your old ones. This is where our sport fails. I’m fine with paying $15 to see a summer blockbuster; such films don’t always work, but they’re designed to give the audience a good time. Mayweather-Pacquiao is designed to squeeze money out of you. And if this was my introduction to boxing, I doubt you’d see me at the next super fight.